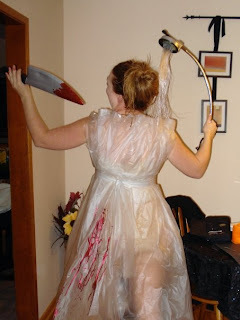 This is what Miss Rebecca wore for Halloween this year. 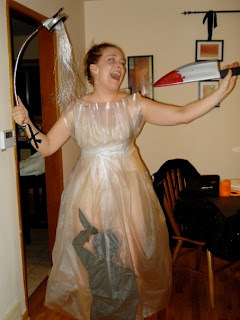 It follows in her tradition of conceptual costumes based on entire movies. Remember this one? She sewed all the pleats into that shower curtain herself and then? Then she flat ironed all that fishing line for the shower. Not only creative but dedicated. And a tiny bit crazy. P.S. She's not naked under there but she went to certain lengths to make sure it looked like she was. Love it! Love! Snaps for super creative! I love Halloween! That's pretty brilliant, and it looks great. She never looks bad at Halloween, even if she looks gross.